"President Brigham Young was reported as saying: 'Our lives are made up of little, simple circumstances that amount to a great deal when they are brought together, and sum up the whole life of the man or woman.' (Deseret News, Oct. 17, 1877, 578. "We are surrounded by media influences and cultural deteriorations that will carry us downstream in our values if we are not continually resisting. To move upstream toward our eternal goal, we must constantly keep paddling. It helps if we are part of a team that is paddling together, like a rowing crew in action. 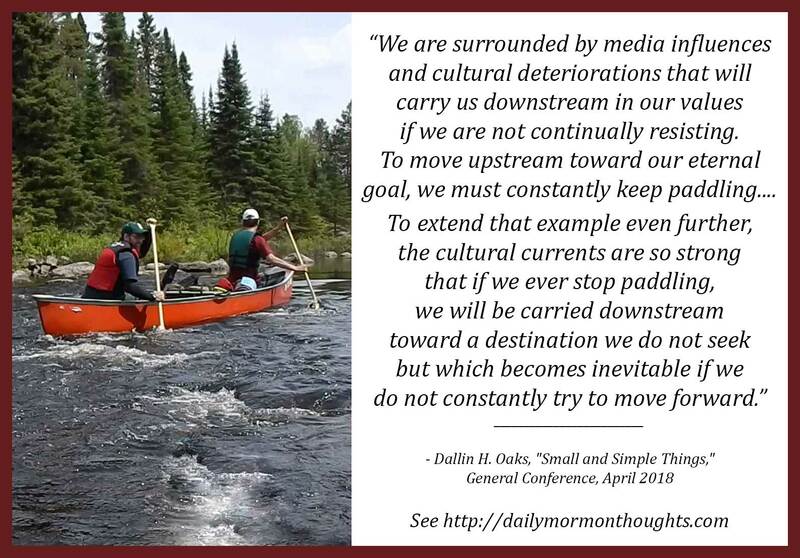 To extend that example even further, the cultural currents are so strong that if we ever stop paddling, we will be carried downstream toward a destination we do not seek but which becomes inevitable if we do not constantly try to move forward." So the message is that we must take control of our own destiny, carefully and deliberately choosing which "currents" we will follow and which we must resist. 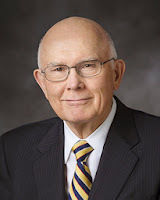 It's interesting to ponder the "cultural deteriorations" that threaten to carry us away. As we come to recognize and identify them, we will find inspiration to know how best to paddle against the currents that would take us to destinations we don't desire.